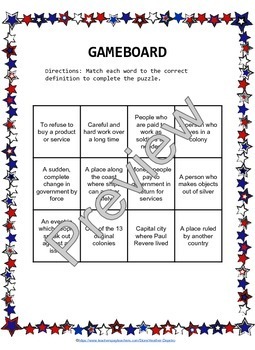 This Paul Revere Vocabulary Puzzle from 4 The Kids is a self checking game great for centers or individual practice. 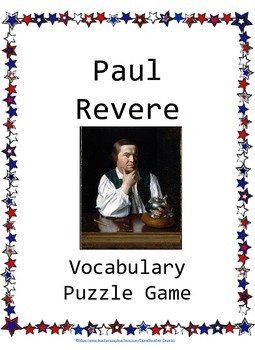 The game is differentiated and includes both a 12 square puzzle and a 9 square puzzle with Paul Revere related vocabulary. Check out my Back to School Vocabulary Puzzle for free to see how the game is played. Check back here at 4 The Kids for more fun games and activities. I will have lots more games in all subjects and levels! 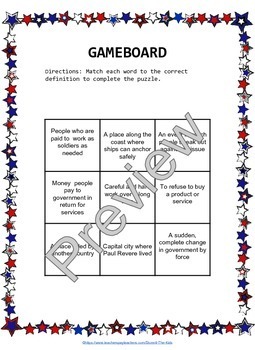 Students will match back to school words with definitions on a game board. When students find a match, they place the word on the game board upside down, covering the definition and revealing a piece of the puzzle. When all definitions are covered correctly, the puzzle is completed! Copyright 2015, Heather DePetro, 4 The Kids. All rights reserved. Permission is granted to copy pages specifically designed for student or teacher use by the original purchaser or licensee. The reproduction or distribution of any other part of this product is strictly prohibited. 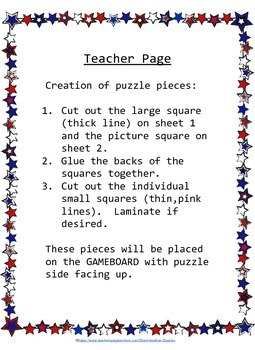 At the time of purchase, additional copies of products can be purchased at half price at my TeachersPayTeachers store for sharing with others. Duplicating any part of this product and placing it on the Internet in any form (even a personal/classroom website) is strictly forbidden. This would make the product available on the Internet, free of charge, and is a violation of the Digital Millennium Copyright Act (DMCA). Thank you for respecting my time and work. I appreciate your business and support!